Avoid any costly purchase and anticipate vehicle issues using the Arkansas free license plate lookup. Enter the license plate number to get a free car report. In addition, Arkansas DFA has public records which may help with your car shopping. For inquiries, you may call at: 501-371-5581 (Driver Service) / 501-682-4692 (Motor Vehicle). Other means of contacting the agency can be found in the Contact Info page. New and used vehicles alike must be registered and titled within 30 days of the date of ownership transfer, or in some cases, from the date an existing lien has been removed. It is advisable that the title/registration process is completed within the allotted time frame as the Arkansas Department of Finance and Administration penalizes late applications. If you can afford, you may also pre-register your car to make your registration experience more convenient. The registration fees of a vehicle vary by type. To register and title vehicles with salvage or similar designations, their VINs must undergo inspection and verification under an authorized agent. Depending on your situation, a bill of sale, odometer statement, and other documents might be required in registering/titling a vehicle. Arkansas requires only a single rear license plate for each car. The plate’s serial format usually consist of three numbers and three letters, although different plate types may carry different serial formats. Fill out the proper form on the list to replace your car’s lost or mutilated specialized plate. Browse through four (4) license plate categories and pick the plate you want. There are more than one hundred (100) plate selections to choose from. Check out the requirements of the specific plate you wish to order. Arkansas DFA offers personalized plates too. Apply online or fill out the form of your chosen plate to get one. Generally, you can transfer a license plate between vehicles that you own if you have the current registration certificate. Visit the Vehicle Tag Renewal page of Arkansas DFA to know more about plate transfer. As stated in the “Arkansas License Plates & Placards” section, the new owner has 30 days to title/register his or her car upon acquiring it, or from the moment the lien has been removed. The owner can be penalized if the title application is submitted beyond the given period. Owners may start the title application by completing the registration/title form at a revenue office within Arkansas. Indicate on the form if a car has a shared ownership. Secure the signatures of all owners as well because the revenue office where the title has been applied may reject your request. Upon the completion of your registration and/or title application, your car’s title status can be identified online using the government’s Title Status Lookup. Provided that you can comply with the requirements, you may ask the Department of Finance and Administration to replace a damaged or missing title. Make sure that you can secure the last registered owner(s) signatures so that your application can proceed smoothly. The entire process may take at least 21 days to be completed. Buying a used car in Arkansas? Don’t make a costly mistake. 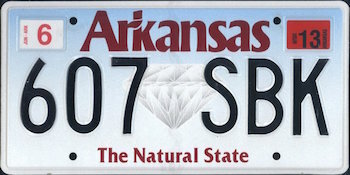 Run a Free License Plate Lookup for your Arkansas-registered vehicle! Run a Free Arkansas License Plate Lookup to uncover the full-story of your Arkansas-registered vehicle.